What makes a kid’s favorite toy? If parents knew the answer to that question, shopping for holiday and birthday presents would be effortless. Kid’s favorite toys are surprisingly simple. Kids enjoy toys that are durably built, easily portable, not too difficult to play with and has a variety of uses. We have compiled a helpful list below to assist you in finding the toy that will become your kid’s favorite toy. Some of the best toys for kids are toys that they can create something with, building toys. When toys are flexible and provide a variety of activities for kids to partake in, they may quickly become favorites. Interlockable building blocks are great for kids of all ages for the fact that they can build durable structures. 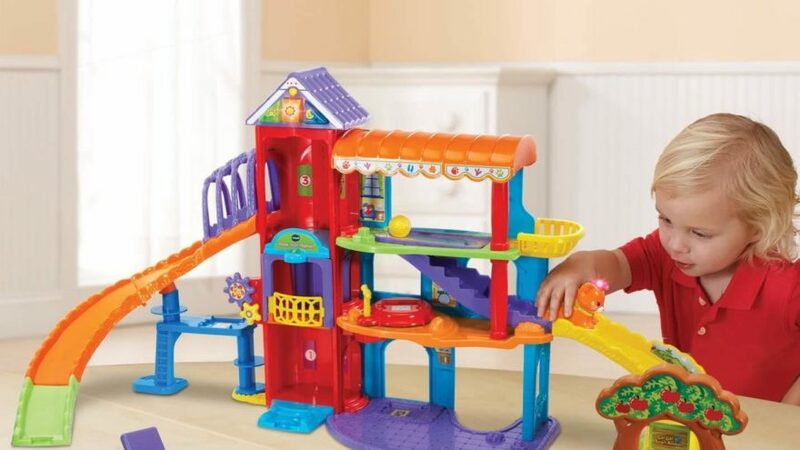 Moreover, building blocks allows kids to create something new each time they play, instead of the same thing which is one of the best benefits that these types of toys have. Versatile toys such as building blocks are sure to keep the interest of kids because they are able to let their imaginations run wild as they think of stories to tell and structures to build. Building Blocks, Lincoln Logs, Magna Tiles and K’nex are literally all building blocks for success in view of the fact that they have many academic and cognitive benefits for kids in many different age groups. Building toys offer kids the benefit of learning about many subjects such as science, technology, engineering, art and math. Building toys usually becomes a kid’s favorite toy because they are exciting and allow for creative play. From bouncy balls to sports balls such as a basketball, baseball, tennis ball or soccer ball, balls are favored by kids for many reasons, mainly because they encourage hands on play. Kids can play many games with bouncy balls such as dodge ball, wall ball, a game of catch, kick ball, simply bouncing the ball up and down, and whatever else that may come to their creative minds. Parents can find rest and have ease in knowing that bouncy balls are very soft, so the chances for a kid to become hurt or injured while playing with one are very minimal. Depending on the type of sports ball that kids may choose to play with, they can play games like basketball, tennis, soccer, baseball or softball, volleyball and more! Sports balls are great for kids to cultivate an interest in the world of sports. Kids love art toys. Art toys have similar benefits as building toys as they allow kids to create something. Drawing, coloring and sketching are favored amongst kids because they enjoy being creative. These toys allows kids to express themselves creatively for the fact that they will have total control over their art. These toys are timeless and have unlimited mobility. Much like the mini coloring books and small set crayons that restaurants provide as families are waiting on their meal, these art toys allow kids to create special pieces of art anywhere. Art toys such as Etch A Sketches and magnetic drawing boards are not only favored by kids, but many parents too. Toys that allow kids to draw or color without colored pencils, crayons and markers will not result in messes. If you do decide to give your kid a set of markers, be sure that they are washable markers so that stains can easily come out of clothes, or off the wall. Always remind your kid to color on paper and not the walls or any other surface that is not meant to be colored on. It is hard to come across any young boy who does not enjoy playing with Nerf guns. With their easy-to-use fire and reload functions, Nerf guns have always been a favorite toy for kids to play with, even at older ages. Young boys love nerf guns because of the many activities that they can do with them. One of the greatest benefits of need guns is that the toy gun can be played with alone or with another person. It is very important for parents to remind kids to never point the Nerf gun at other people or someone’s face, and to always be very careful when handling guns, even if it is just a toy. Kids love Nerf guns because unlike most hands on toys, the nerfs are very soft. Dolls have always been a childhood favorite for young girls to play with, however, Barbie Dolls are more popular than ever. Young girls are completely awestruck whenever they see and play with the latest Barbie doll that has released. Girls love playing with Barbie dolls on account of the fun activities that they can do whenever they play with them such as dressing the dolls up and doing their hair. What is even better is that Barbie dolls in this day and age come with a large amount of occupational accessories. Mattel provides Barbie dolls that are nurses, doctors, firefighters, ballerinas, flight attendants, tennis players, guitarists, park rangers and more. Barbie career dolls can surely encourage kids to become interested in a future occupation, in contrast to the princess Barbie dolls. Barbies offer young girls the option to role play. Which may be why kids love Barbie dolls so much, for the fact that they are able to pretend that they are a variety of people and act out different scenarios. Kids have very active imaginations and playing with Barbie dolls will only enhance their imaginative, pretend play. Kids are sure to keep coming back to their dolls over and over, for years on end to engage in fun play. Action figures are the favorite toys of many boys and girls. Despite what many people may think, action figures are not a thing of the past. Similar to Barbie dolls, action figures allows kids to engage in many activities as they are playing and they are great to collect over the course of a lifetime. Kids will never run out of ideas for the things that they can do with action figures. Action figures are favorite toys to kids and many parents as well, because of the many benefits that they have. Kids can learn to identify action figures simply by the colors that they wear, or by their mask or cape. In view of the fact that action figures are awesome to collect, kids will have no problem starting this fun hobby because there is a large amount of action figures on the market. Kids are not limited to only Superman, Batman or Wonder Woman. Kids can collect action figures that resemble community helpers such as firemen, police personnel and mail carriers, in addition to collecting and playing with action figures from their favorite movies and TV shows. Whether it is a toy radio or a miniature guitar, kids are sure to love it. Toys that stimulate auditory sensory are favored by kids of all ages because they love sound and music. In addition to that, auditory sensory stimulating toys promote confidence as they may encourage kids to sing and provoke conversations that are related to music with others. Furthermore, kids who are introduced to practical musical toys such as a keyboard, xylophone or guitar are more likely to want to learn more about how the instrument really works. This cultivated a great interest in kids and usually results in them playing the instrument for years to come. Kids are easily captivated by new sounds, and fun musical toys will keep their interest for hours on end. There is no secret as to why the aisles of toy retailers are full of toy that make sounds, kids love them! Tents have been a huge favorite toy for kid for many years. Have you ever wondered why kids love building makeshift tents underneath the dining room table, inside the coat closet or around the sofa? When a kid has a tent, an entire new world is opened. Tents provide amazing activities for kids to do, not only can kids do a pretend camp out, which kids absolutely love to do, but with a real tent, kids can participate in a real camp out. In addition to that, kids can use the tent to engage in everyday play. There are many different types of tents for kids to play in. Many tents are easy to assemble and transport, so that kids can always have their tent with them. Things that makes a kid’s favorite toy should definitely be taken into account when purchasing toys for kids. Toys should be well-built to stand up against frequent use. They should also be lightweight so that they are easily portable ensuring that kids can take it everywhere. It is important that the toy has a variety of uses and benefits to keep the kid’s mind stimulated. Also, so that they can reap the maximum benefits of the toy. A kid’s favorite toy should be both, educational and enjoyable for the kid to play with. Both of these factors are very beneficial to kids and paired together, educational and enjoyable toys will ensure that kids will come back to the toys over and over again for years to come.